XCOM 2 was a good game I would've called great if it wasn't the sequel to Enemy Unknown, and War of the Chosen is a great expansion I would've called a classic if it wasn't following up Enemy Within. Almost everything it adds is brilliant: In particular, the Chosen are strong antagonists that do a lot to add pressure the first game was missing, and the introduction of soldier exhaustion forces you to swap out units and create a more diverse squad than the six colonels you used to do everything with. The individual units are much more interesting as well, since they've introduced faction heroes with entirely unique ability trees and given regular units the option of paying from a special pool to unlock extra skills from their own and other character classes. Loads of smaller changes to the way research, upgrades, and other mechanics work, as well as the addition of covert operations are almost all for the better, even if the Reduce Avatar Progress mission is absurdly overpowered. Against all of that, I only have two complaints specific to War of the Chosen. First, Chrysalids have been given a new ability that essentially turns them into land mines with a trigger radius of an entire turn's movement. There's no good way of countering this except inching forward and with three soldiers on overwatch, which is tactically mindless. The Chosen Warlock, meanwhile, has an ability he uses every two turns that can be trivially countered by running backwards and one-shotting the enemies he spawned in the open. If you have the bad luck to encounter both of these enemies on the same mission, it adds at least a dozen extremely slow turns in which you'll make no interesting decisions whatsoever. Other than that, the Chosen don't scale particularly well to increasing player strength, so they're pretty much non-threats by the time you have plasma weapons. In the end, though, the game made me finally realize what it is about XCOM 2 that keeps me from loving it as much as its predecessor: I hate permadeath in long games and will save scum like no one's business to avoid it. In EU and EW, this doesn't make the game less interesting - you obviously aren't losing important soldiers very often, but you still have the extremely stressful race against time to keep nations in the council and keep pace with satellite deployments and fighter coverage. In the sequel, however, nothing really takes the place of permadeath once you cancel it out. Keep every region in the resistance isn't hard, and there's no resource or technology pressure once you've got plasma weapons. The game is nearly as enjoyable as EW until you reach the point at which you can safely take down the Chosen, and then there's just nothing left even though you're only 30% of the way through the game. I can appreciate why people who like permadeath enjoy this game so much, but this playthrough took me 28 hours. There is absolutely no way I'm going to take the risk that a few bad decisions or RNG rolls could completely trash that at the end. War of the Chosen is, as I've said, still a great expansion, but it still isn't quite able to overcome how much more I enjoyed the first game. It's hard to think of a reason I'd played this over EW if I'm in the mood for more XCOM in the future. I was really interested in this game before it came out. It was one of the first games to come out of ex-Irrational devs, had neat design, and was releasing at a time when we still weren't seeing too many of these quieter exploration games. Then it was almost universally panned as boring and uninspired and I forgot about it until Humble had it on sale for a dollar last week. Surely it can't be bad for that price, right? It can. Submerged is basically an hour of climbing sequences from Uncharted if that game was really badly animated, it was impossible to lose the climbing sections, the environment wasn't interesting, and nothing ever happened. There's a story about why the world is all wet, but it's told entirely through scattered children's drawings and was completely incomprehensible at the level of attention I was willing to give it. The story about the characters on screen is predictable right up until the ending, when it subverts your expectations in order to be more boring. I had never played a game like this. It's amazing all over the place. It's best described as a puzzle platformer where you manipulate time. The game is divided in worlds, and in each world there's a different way of controlling time. In the first world you can rewind time by pressing the spacebar; in the next world you find objects that aren't affected when you rewind time; in the next world time moves forward when you run to the right, and backward when you move left; and so on. The puzzles are brilliant though still manageable; each new time control mechanic is carefully introduced by way of example, and thoroughly explored and exploited by the time you finish its section of the game. The game even manages to sneak in some humor in the puzzle design. The story is told via nothing but snippets of text between worlds, yet somehow the game makes you care about it enough that the twist ending is genuinely surprising. Braid is clever, funny, sentimental and sometimes philosophical too. It's an amazing experience and I'm glad that I had the chance to enjoy it. This is not a game you finish, in the sense that it just goes on and the makers keep adding content, in typical fashion for a mobile game, but I don't foresee quitting the game any time soon, so for reviewing purposes I'll consider it finished. While I haven't played other games in the series, my understanding is that it's a pocket version of Fire Emblem: a turn-based tactics game where you direct a team of (usually) four units around a map to attack and defeat the enemy units, taking into account the different properties and values of how each unit moves, attacks and defends. Teams are built from a selection of heroes that includes a handful of starters and a few heroes obtained via quests, but the bulk of your collection comes from randomly summoning heroes by spending orbs, which are obtained as a reward for clearing maps. The game has moments that will make you feel like a master tactician, and while you're ostensibly doing it for the orbs, managing to clear an especially difficult map is rewarding in itself. As your collection of heroes grows larger, you find that mixing and matching them into teams appropriate for each task is also an art. The hardest maps may take many rounds of delightful trial and error, swapping heroes and planning combat turn by turn before you can finally crack them. Granted, sometimes it will just be that the AI is ridiculously easy to manipulate and you just need to find the right way to get it to do what you want, but in general the game is a fairly satisfying tactical challenge. That said, there are a few problems related to the game's collectible format. For one, it's very luck-of-the-draw; for a long time my best units were all the same, and I had to make do with whatever units I had in other colors to build a decent fighting team. The game sort-of makes up for it by occasionally offering quests that reward you with specific heroes, but some of them are grindy, while others are very difficult unless you can already build a good team for the deed. The other problem is that you will end up with lots of duplicates of the most common heroes; the game has a few ways of putting them to use, but surely none of them is any appealing in the long run (I haven't reached that point yet, fortunately). Other aspects of the game related to its free-to-play model are also quite annoying. Many events and quests are really grindy in nature, and while you can just skip them with no consequence, you can't help feeling that you're being cheated out of the rewards. Moreover, for a massively-played game with hundreds of thousands of players, there's barely any player-to-player interaction. You can build a friend list, but all you can get from it is tiny amounts of goods and the occasional random greeting. Even the Arena mode just has you fight player-created teams under the control of a CPU (try building an effective Arena team with no clue whether the computer will follow your intended strategy). As for the game's aesthetics: the story mode is bland, and while most of the character art is beautiful, there are so many different artists involved that you can't help but notice the inconstancy (sometimes they couldn't even get the same artist to draw two versions of the same character!). The voice acting is also rather hit-and-miss, as is the dialogue and the overall characterization. On the other hand, the music is thoroughly enjoyable. You should probably give Fire Emblem Heroes a chance, especially if you're looking for something to play on the go. Katamari is a series I never get tired of, but I'd only played the PS3 and PSP/Vita releases until now. The original had all of the silliness that makes the franchise so great, but its level design is more limited, there are frequent framerate issues, and the controls are terrible. It's still a ton of fun, but with these games all pretty much being the same thing, it's hard to recommend going back to this one for anything other than thoroughness' sake. I've never gotten into the Uncharted games the way a lot of people do. They're good enough that I look forward to playing them, but with the exception of Among Thieves, (which I haven't played for six years, so who knows if I'd still think this) I've never come away feeling like I'd just played something really special. They're good, but they don't do anything other than console graphics and setpieces remarkably well. I bring that up because, even though Uncharted was initially mocked as "Dude Raider" for mimicking this franchise, it's pretty clear which was bigger by 2013. Tomb Raider may be a decade older, but the presentation of 2013's reboot and Square's absurd 6 million unit sales goal for it leave little room for doubt that the relationship had reversed. Since they're apparently so eager for it, I'll do most of this as a direct comparison. Let's start with its big win: TR is far and away the better shooter. UC's combat is often just there to compliment a set piece or stop you from immediately getting to a puzzle, which means they didn't always put much thought into the enemy placement or level design. TR is much more consistent about creating enjoyable scenarios and mostly avoid's UC's love of bullet sponges and cutscene attacks. It also helps that you're working with four persistent upgradeable guns instead of stealing dead enemy's weapons, which lets them do more with your weapon's unique capabilities. The end result is that, where combat is usually a distraction in UC, it's one of TR's strongest components. A few ill-conceived QTE's aside, I don't have anything negative to say about it. Visually, I think TR is the winner, but I have to admit that my setups are about as biased in its favor as they possibly could be. I played TR on PC in 4K, and I played every UC (except 4) on a PS3 in 480i. They're pretty close in terms of art direction. UC's clearest advantage is in controls. Once I got past the tutorials, there were very few moments in that series where I felt like I was struggling to get the game to do what I wanted. TR is basically the opposite. Even though the game frequently sets up jumps that would be most quickly traversed by jumping up and to the right (never left or down, weirdly), pressing W and D to do that will instead result in jumping only to the right and a game over. Most of my other deaths came to a specific QTE icon that always felt like it wanted me to press F on the edge of the circle when it actually wanted F inside the circle. There are loads of smaller frustrations as well - even though they'll very rarely kill you, snapping to walls or ziplines never feels quite right, and some puzzles require you to approach from overly specific angles. I don't think either series is particularly brilliant at story telling, but UC gets the win here because it's not trying to be anything more than fun. I can excuse a lot of its nonsense because it's usually happy to point out how dumb it is on its own, or at least to draw the focus to something more grounded. TR learns exactly the wrong lesson from this and instead doubles down on a gritty story that's just stupid. Where UC usually explains away why its "lost city" is full of baddies by saying one specific mercenary group found it at the same time, TR goes out of its way to show you that everything from modern rescue planes and supertankers to a ****ing battleship have crashed on its lost island, all of which were apparently so thoroughly forgotten that no one even found the place on Google Earth. This complete lack of attention to detail is pervasive throughout the entire plot - the bad guys who all crashed independently on an island of the coast of Japan are initially entirely Eastern European, but for some reason speak fluent English. Then the game decides accents are hard and just makes them all American with Russian names. In a similar vein to "accents are hard", Lara is allegedly fluent in medieval Japanese, but has such awful pronunciation that she'd flunk out of an intro course. This kind of thing would be fine if, like UC, it didn't dwell on it, but it does. It wants to be gritty UC, and because of that it is absolutely determined that you pay attention to its nonsense story full of plotholes and one-note characters. Which is a lot of words to say that, at least from my perspective, it pretty much accomplished what it set out to do. It hits all the same notes as UC with a slightly different combination of strengths and weaknesses and ultimately balances out to that same "good-but-not-great" category. reveal that the Nazis actually discovered all of this first in WWII, but weren't able to overcome the immortal curse. Then UC2 and TR2 are both games that start with the protagonist almost dying in the Himalayas, but which interrupt that near death with a flashback to a few weeks earlier in the Middle East. If you have any shred of nostalgia for either Mario Golf in any form, or Mario Tennis for the GameBoy Color, I'd say to you that Golf Story is a must-play. The game has the same kind of story as Mario Tennis GBC, which is a hidden gem in its own right. The writing is incredibly charming and downright funny, with memorable characters and some awesome scenarios. The majority of the problems in the game are solved with "hit this golf ball-shaped thing into this other thing," with variations on that theme. Later in the game there are a few other gameplay scenarios, such as a stealth section or a detective murder mystery to solve. But even though most of the game is purely "hit golf ball, win money and EXP," I think it kept things interesting throughout. For instance, you're paired up in 2v2 tournaments with worse golfers who take terrible shots that you have to recover from, or you're forced to use bad clubs because of an antiquated rule on an old golf course. The side quests were fun to track down and complete, and the main quest was enjoyable throughout. The EXP system is intriguing in this game. You Increase your stats, but if you increase your Power, your other stats will drop accordingly. This basically means that you want to max out your Power as much as possible while still keeping your Control, Spin, and Swing as even as possible. Not a complicated leveling system, but one worth having. There isn't a whole lot of min-maxing to be done, so don't expect too much out of it. 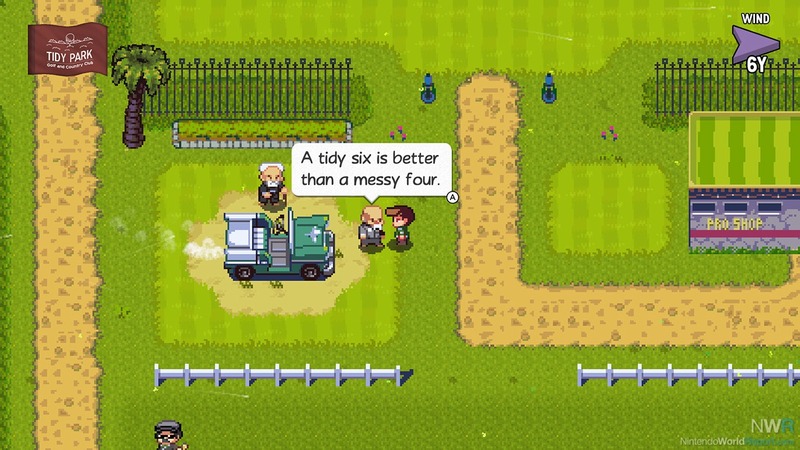 An interesting thing about Golf Story is that the 2D nature of the game makes it so that chipping into a hole is actually, in my opinion, much easier than putting into a hole. I got the hang of putting by the end of the game, but chipping was always more effective throughout. My one complaint with the game is that it wasn't very hard. The difficulty curve was nice and steady, but I feel like the endgame tournament was still a liiiiitle too easy. I found it hard to believe that the pros on the premiere course in this world could only score a 1 over 9 holes. Aside from the lack of difficulty, I also found a few bugs in the game--some camera freezing, one near-softlock, a room in the mansion that I couldn't enter properly. Nothing game-breaking, but enough to say that the game could use a bit more polish around the edges. Overall, the charm of the game is what wins the day. There was a rap battle. A murder mystery. A vengeful ex-wife. A hot-shot pro who won't give you the time of day. A broadcast network that only gets the same responses to every question they ask. Birds and Moles on the golf course that hurt you--or help you. I was hooked on this game, and it gave me a great thing to play on a flight I had recently. If you have a Switch, I'd urge you to pick it up. My one complaint with the game is that it wasn't very hard. The difficulty curve was nice and steady, but I feel like the endgame tournament was still a liiiiitle too easy. I found it hard to believe that the pros on the premiere course in this world could only score a 1 over 9 holes. No extra difficulty modes either? Maybe, if I start a new file...? I didn't think to check. I saw this game when it initially came out and thought that it looked interesting, but not at all fun. Normally that'd be the end of it, but Humble Monthly gave it to me, so I can now say with confidence that it is an interesting game that is not at all fun. The basic premise is that you're wandering through a cave with some kind of LIDAR/VR headset that draws a point mesh of the environment as you point a little gun around to scan. It's cool at first, but gets tiresome after about 5 minutes. It's, save for pressing a few buttons, the sum total of your interaction with the world. Scanner Sombre wants to be a lot of things, but it doesn't commit to any of them. It's most obviously categorized as a walking simulator, but the story is so threadbare than when it attempted a plot twist I was most surprised by the revelation that there was a plot, and the exploration is essentially non-existent. You must go everywhere you can go - the closest you'll get to discovery is scanning things for longer than you need to. I think the devs realized it was a pretty crap walking simulator about a quarter of the way in, because they abruptly turn it into, in sequence, a bad horror game, a bad platformer, and a bad puzzle game. It's a bad horror game because the "monsters" mostly just annoy you with loud noises and never pose a serious threat. It's a bad platformer because the controls are slippery and no one ever wanted to platform in the dark. It's a bad puzzle game because the "puzzles" are just navigating around obstacles. I would've quit this game halfway through, but its 1 hour runtime was almost the same as the podcast I was listening to. It's the worst game I've finished in a good while. ME3 isn't perfect. It bugged out once or twice and recalled events that never happened in my playthrough. It's obsessed with that kid that dies in the first twenty minutes despite never giving you much reason to care beyond "he's a kid." It's even still got some of the stupid from ME2, like with whatever the hell happened to Ashley's (this was the first time I didn't blow her up) design and the sudden introduction of cyberninjas. There's animation weirdness, conversations where each party was clearly written in isolation, and more. I heard something about the ending once, too. But even acknowledging all of that, it's still a masterpiece. Start with the choices. Where no one was ever really at risk until the final mission of ME2, ME3 isn't afraid to hit you with character deaths even in the opening quarter of the game. You might miss out on tons of content as a result, but it lets you make that decision. Similarly, where ME1 usually kept the story within scope by keeping the impact of major decisions off-screen, major decisions in ME3 have immediate and significant impact. If you abandon a character or species in this game, you're going to see the death you've caused on screen, not in a codex entry. Very few games can rival this scale of player control, and I'm not aware of any that can do it on the back of two other games. It's still tremendously impressive five years on. Which is all great, but what really matters for the finale of a trilogy is how well it can deliver on all the threads the earlier games built up. And that's where this game truly shines. Yes, the story is ostensibly about the Reapers, and yes, it talks about them a lot, but they're not what's interesting in hindsight. It's a last hurrah for all the characters you loved from the first two games, delivered with the kind of authenticity and familiarity that only comes from having known them for the better part of a decade. It's a conclusion to every mystery in the galaxy that, because of that familiarity, I always felt genuinely invested in. The Rannoch missions in particular are still among the best I've ever played. And thanks to the wonders of headcanon, I don't even need to address the elephant in the room that is the ending. Everyone says Citadel would've been a better conclusion and you know what? They're right. It's five hours of unabated fan service and in-jokes, sure, but it's good fan service and in-jokes, and that's exactly what I wanted from a revisit. I had ME3 around #6 all-time before replaying it. Doesn't have much room to move up, but I'm going to have to find some. I really wanted to like this game. It does some really creative things with the idea of hitting a golf ball, the humor is generally on-point, and the rap battle ML mentioned is fantastic. I was in love with it for the first few hours, but the little annoyances kept adding up, and in the end I can't muster much more than a "meh." ML covered the positives well, so this is going to be almost entirely negative. The biggest problem is that, while the game does come up with an impressive number of reasons to hit golf ball-like objects at circular targets, your methods for doing so never really evolve. It's extremely easy to stop the shot markers almost exactly where you want them, and as long as you don't miss by a huge distance, the main character is an absurdly precise shot. ML mentioned that chipping is easier than putting, and a big part of the reason for that is that you can reliably hit the flag pole from 150 yards when there's no wind. That ridiculous shot consistency means that the game only has two ways of being challenging: add wind and add uneven terrain. The first isn't really a problem - you get a speed and direct, so you can usually approximately account for the drift - but the second might as well be RNG. There is no indication of terrain slope unless you're standing on it, and then you only get a direction and degree (low, medium, etc) for that exact spot. Sometimes you'll drive near the green and have the ball shoot off into no man's land because, guess what, that was a hill. More importantly, putting is basically useless because controlling the ball is essentially impossible and you can just chip at the flag pole. It creates absurd situations where landing in rough or even sand traps near the green is often better than actually being on the green, because you know exactly where the ball will stop in the former and are usually set up for an easy 30 yard chip shot. As a result of these issues, the games challenges are mostly either pointlessly easy or essentially guess-and-check. Next, everyone in this world is terrible at golf. You'll play against loads of people on all eight courses over the course of the game, but losing is basically impossible on all but the final course, where second place at least manages about par. You'll frequently see scores of +4 in second place on other courses, and supposed professionals hitting +4 on a single hole in match play to guarantee you pick up the win. Even when they're forcing you to play with a terrible teammate, it just amounts to having a 1 stroke handicap, which isn't anything close to enough to make it competitive. It ends up being tedious instead of exciting. Lastly, although the writing and story are generally good, the protagonist is pretty lame. I get that they're making fun of the traditional JRPG protagonist that just does what everyone asks of him, but as is often the case, pointing out the trope and then doing it anyway just makes it more annoying. There are plenty of interesting characters in the game, but you're stuck playing the most boring guy in the room, and the game *really* wants you to know that. Mostly made me wish I was playing someone else. Oh, and one more thing. Who thought it was a good idea to have the game make sound through the speakers even when you're using headphones or the system is muted? Sometimes handhelds need to be quiet, devs. I'm not sure if it's just a bug (like ML said, there are tons), but it's totally unacceptable for a game people are going to be playing on airplanes and busses. No one wants to hear that slide whistle. All in all, it's definitely not bad, but it very much needed either less content or more polish. You're the leader of a cult that's spent the last 467 years awaiting the return of Chernobog. There's only three years left, but you have to sacrifice a villager every three months, and the village will collapse if you let its morality slip or anger any of the five houses too greatly. Those five houses provide the solution to two of those problems - their six family members will be the source of both your sacrifices and your moral enforces. The catch is that every season's sacrifice has to be one of that season's agents, and sacrificing anyone except a major sinner has massive repercussions on your reputation and village morality. That means that, in the short term, you have to make sure you have both effective agents and an irredeemable sinner in every season. But, in the long term, you also have to make sure you're not choosing the same family for sacrifice too frequently nor neglecting one for duties, because you need all of them to approve of you in order to receive their scion's help in finding sinners. On top of all of that, you need to protect the five divisions of morality from ever falling too low as a result of ineffective agents or sacrifice backlash. It boils down to a game about progress bar management, but I love those, so it's brilliant. It'd be a shoo-in for the yearly top 10 if not for the fact that it's very short and there's basically no replay value. I beat it after four tries and about two hours, and while I could go back to see more endings, all of them are just "let X bar be empty when you win." Nothing significant is ever going to change about the gameplay - I'd have loved to see either a greater variety of events to throw off my plans or a longer and more narratively involved campaign. Still, it's a good game and well worth playing. Indie devs have been trying to recreate Mario for ages, and while games like Poi have mostly gotten the controls down, none of them have ever really managed to get close to that series' charm. Until now, anyway. A Hat in Time has all of the precision control you'd want from a game like this, but it's also able to compete with Nintendo's flagship on humor and enthusiasm. I don't want to spoil too much, but this is a game that features both a fish mafia and the avian Oscars. The gameplay is just as varied - there are lite horror levels, a Mad Libs murder mystery, races, great boss fights, and even challenge levels akin to Sunshine's void levels. There's honestly very little I'd criticize about it - I only ran into a few bugs, performance was constantly strong despite my insistence on setting the draw distance to basically infinity, and level design is almost always clear. The one thing I can see some people disliking about it is that it's pretty hard to die. Extra hearts are extremely plentiful and checkpoints are pretty generous, so only a handful of required areas in the game are every going to give you much trouble. There are some optional collectibles that can be tricky, however, and a one-hit KO mode that seems pretty demanding. It's also got a slot machine reward system powered by collectibles and completing optional levels where most games would've added microtransactions. It's not a huge thing, but it does give you redesigns for your power hats, character palette swaps, and level music remixes. They're all pretty awesome. I'd call it a great way to hold you over until Odyssey comes out, but honestly, I liked this more than any Mario game. This is one of the only 3D platformers I've ever beaten, definitely the only one I've ever 100%'ed, and probably would've been a Game of the Year challenger if I was a bigger fan of the genre. Still might be top 5 for the year. This sounds amazing. Will probably play. 17.) Mega Man X: How are you supposed to know to go to Chill Penguin first? This game might as well be called Sierra Souls with how obfuscate it is. Genji Infaune and Namco should be ashamed. 18.) Cuphead: I got all the achievements about a week ago. It was a very fun game with a great animation style and soundtrack. The focus on boss battles over run and gun stages is a bit weird at first but eventually you get used to it. It's more Gunstar Heroes than Contra. The game has a reputation of being difficult, but honestly there's little to no penalty for dying so I'd say that it's not really that tough to get through. Overall I'd say Cuphead is definitely worth its full price. 1.) The Simpsons: Hit & Run - It was a really fun experience overall, glad I played it and it's definitely one of my top 10 Gamecube games. Control-wise, it's pretty good. The vehicle controls feel a little loose and hard to control but I feel like that's by design (or at least the missions accommodate for it). It feels rewarding to learn how to control vehicles with somewhat realistic physics in a fast cluttered world but I'm a little sad that I never really got the chance to take the shackles off and drive around in a huge open area or something. The character models look kinda whack I'm not gonna lie (especially Lisa), but imo it's made up for by the amount of detail put into the environment. Every square inch of each level has character, there's humorous signs and familiar locales from the show and in general feels like an authentic world rich in detail. Which leads into my next point, which is that the game has a lot of fanservice for Simpsons fans. The collectible cards are all memorable objects from the show, there's a lot of recurring characters who show up, and the humor is very Simpson-esque throughout. I was a little bummed there was only 3 maps throughout 7 levels though. They have changes, such as aesthetics and different areas being accessible, but it still didn't change the feel of the levels that much. This was also exacerbated by the fact that I went through these levels extensively multiple times to collect all the collectibles and grind for money. Oh, and that's another thing. Everything gets more expensive as the game goes on, but you only earn about the same amount of coins in each level. Once you get all the crates, vending machines, and wasps out of the way, all your big money options outside of bet races are gone and you largely have to rely on getting pocket change from destroying random things. It made 100%ing the game kinda tedious. Grievances aside, I really liked this game and would recommend it to anyone who hasn't played it yet. Just know that you might get a little impatient trying to 100% complete the game. This one puts you in the role of an investigator hired by the totally not GCHQ to catch terrorists by surveilling the hell out of everyone. You've got access to the internet and phone networks, as well as anything that can be reached through either of them, and are basically tasked with chaining clues together to find more clues and solve a chain of bombings. This typically means reading people's blogs to get contact information, listening in on a phone call or chat sessions, finding more information online, listening to a new phone call, and so on. I don't normally like these kinds of games, but it's well-written, puts a reasonable amount of effort into world-building, and doesn't fall into the usual trap of claiming it's an "uber realistic h4ck3r simulator" because you can use commands like cd or ipconfig in a fake terminal. It has its own believability problems, for sure, but at least it never claimed otherwise. It executes those ideas phenomenally for the first 3.5 chapters. You actually have choices in terms of what information you give to your handler and how to resolve conflicting entries, which gives you a lot more agency than these games usually provide. You've got the chance to stop the third bombing with your detective skills or random guessing, and the there's a particularly cool chase scene where you're listening in on the bomber's phone call the whole time. Sadly, it all goes a bit to **** in the last 1.5 chapters. There were silly bits in the earlier chapters - sending bank account numbers in emails, people announcing their chat names for no reason, etc - but the final scenes are filled with moments that feel like they wanted certain story beats and just said just bent technology and logic however much they needed to get there. From decryption that somehow only applies to new audio to tracking people using an app that seemingly arbitrarily lists places you've been instead of the supposedly ubiquitous cameras or cell towers, the puzzles in this section just don't make any sense. Your choices in the final decision don't have plausible effects, and there's some evidence that contradicts the mastermind reveal that they just never address. I'd still recommend playing it for the three hours that it's good, especially considering it's pretty cheap in sales. Just be prepared for it to fall apart in the final quarter. TD looks like a 2D adventure game in the screenshots, but it plays more like a visual novel that happens to let you walk around. There aren't any real puzzles, and everything you can interact with is clearly marked. Instead, the focus is on dialogue and choices. Loads of 'em. There's some like eight different endings, plus some characters that can have different fates, and those choices play into said endings in variously subtle or not-so-subtle ways. I would've liked to see some more dramatic branching in the early game, but all things considered, it's well done. It also tracks a few parameters that change based on your actions and supposedly affect the way characters treat you, but I can't judge that after one playthrough. As you can probably guess from the name, it's a Japanese horror game. It's effective at that, and there's some brilliant sound work to go with it, but the story follows the usual beats for the genre. That said, while the ghost story doesn't innovate on the genre, the more grounded elements are a great addition. Almost everyone you talk to is a regular person with their own problems and flaws that are (almost) completely unrelated to murder ghosts. It helps make the story feel like it's taking place in our world instead of just one that looks similar, and violence is almost always an option if you just hate people. The ending I got wasn't completely satisfying, but it was pretty clearly a bad one, so I'll probably go back for NG+ eventually. I liked it a lot. Thanks for your thoughts on Golf Story, Ian. You raise a lot of good points. For what it's worth, I'm pretty sure that the only terrain that actually has slopes are the greens. I got pretty familiar with all the courses in my quest to Gold Medal every hole (which I did! ), and I'm fairly certain every fairway/rough/deep rough is considered totally flat. Only the greens have a slope. And yes, EVERYONE else is terrible at Golf. It's my biggest criticism of the game. Anyway, I finished Samus Returns. For my thoughts on it, go check out the thread in the Metroid forum. I'll reiterate this point--while I think Super is still the best of the series and darn near perfect, I think Samus Returns is now in "toss-up" territory for second place, during it out with Prime 1. The game is phenomenal. ^I only had a major problem with it off a drive once, now that I think of it, so it might've just been a bug. If it was, that might take the annoying bug trophy from random parts of the ground secretly being water on the spooky course. Sometimes, if you hit the edge of water, your ball shoots REALLY hard in a certain direction. I had a drive over 450 yards because I accidentally hit the front lip of a water section on a Par 5 and shot my ball ahead probably another 60-70 yards or so. Not sure if that applies to your situation at all, but it's a quirky thing that happened to me. Wish I were recording it. After playing AM2R and Samus Returns, I decided to actually go back to the roots and see what Metroid II was all about. I remember playing this as a kid, but I was so confused and lost that I never even made it to the first Metroid. Part of the problem was certainly that it was my first experience with Metroid, so I had no concept of exploration or hidden items or anything like that. The simplest thing I can say about Metroid II is that it really needed to be remade. I'm not sure what I can say that hasn't been said about this game a million times--small field of view, lack of color makes areas confusing, some things are hidden in far too esoteric a fashion, the metroids are annoying to fight, the final boss is mostly unfair, refill stations are pretty hard to find and sometimes you get caught very far away with not enough missiles to kill a Metroid...stuff like that. Full disclosure: I did use a map that I found online. Quite honestly, I didn't have the patience to try this game without it. I did make it to the third area before I busted it out, but it was just getting so disorienting and confusing that I found a map necessary. If I hadn't been playing with a map, I would not have found the drive to finish. The game is flawed, but I will say one thing: it's extremely ambitious for its time and platform. The sprites look great. The controls are responsive, except maybe the Space Jump. I think there's a lot to like in Metroid II, but it wasn't easy to play in the 90's and it's extremely not easy to play now. But I'm glad I played it, if not only to be more well-informed about this game and its remakes (and Metroid in general). Maybe someday I'll get around to playing the NES Metroid as well. But...not now. I also finished Golf Story and it's the first game I've actually finished in a very long time. Overall I thought it was really fun and found it hard to put down because of the charms. The bugs definitely got annoying, though. My first time playing the Oak Manor course had to be restarted because I hit a pumpkin that bounced the ball so far out of bounds that I couldn't hit it back in. The physics of hitting obstacles like trees was frustrating throughout because things like hitting a tree or the edge of water like ML said can take your ball dozens of yards completely out of the way. The game was probably too easy. Ian's right about your ability to be incredibly accurate. Until the very last course of the game, things like wind really never play a factor into your shots unless you're doing a wind-based side challenge. What's been said about putting is definitely true too. If you land outside the green it's a pretty easy birdie/eagle. If you land on the green and have to putt, that's probably when you're going to hit something over par. Though this is actually pretty true of my own experiences in golf. I've always been really solid at chipping while putting is a menace. I thought the game is still fun enough to warrant buying. It's really charming and funny throughout. I hope some patches come out to fix the bigger glitches in the game. So yesterday I made the mistake of going into a GameStop, and so of course I bought this crappy looking Titanic mystery puzzle game from 2007 for the Wii on clearance for $5. "TITANIC: SECRETS OF THE FATEFUL VOYAGE"
I was expecting a 2/10 and was a bit disappointed to play something closer to a 5/10. Some parts of it actually came close to being good. Not many though. Anyway, it entertained me all day today so I would say it was worth the price. The following is my review of this critically acclaimed game. Throughout the game you make various dialogue choices which are inferred to have an impact on the eventual outcome. You are met with various guarded people and overhear many questionable things, hinting at a great mystery waiting to be uncovered. Numerous puzzles are scattered about the setting to test your wits as the ship forges on to its fated doom. Aaaaaaaand absolutely none of these amount to anything whatsoever. There's literally no mystery, the ship is sinking because they hit an iceberg. You essentially break into people's s*** just because. The only dialogue option that matters is at the end when you decide whether to save your stalker mom or your douchey husband (I saved stalker mom). And there was one (1) solidly good puzzle in the whole game, with like 3 others that were enjoyable. But the protagonist spends the last ~hour of the game bragging about how goddamn awesome she is at vandalizing things, there are little cutscenes where you have to waggle the wiimote around to smash stuff, and also I reiterate that it literally cost me 5 dollars, so I would say it's a very good game considering and was well worth it.